Best days of your cycle to ride the Tilt-a-Whirl! Home > health > Best days of your cycle to ride the Tilt-a-Whirl! 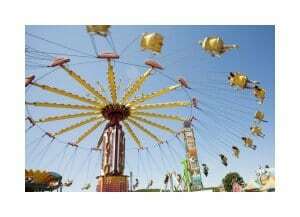 10 Sep Best days of your cycle to ride the Tilt-a-Whirl! Next time you plan a trip to the amusement park, want to schedule a cruise or are thinking of doing any activity where you’re going to be spun around or see-sawed, consider the week you’re on in your cycle. According to a study in the journal Women’s Health Issues, you’re more susceptible to getting motion sickness during your Week 1 (when you have your period) and Week 4 (your premenstrual week) and least likely to get queasy during your Week 2 and the first half of your Week 3. As the researchers explain, it may be that a higher level of estrogen on these days enhances parts of the brain that keep you from getting dizzy when being moved around.